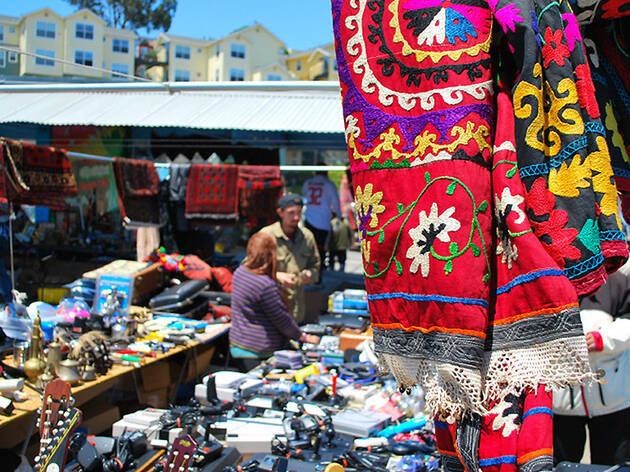 Whether you’re a seasoned vintage clothing store scout, a casual collector of antiques in San Francisco, a practiced haggler or simply an unabashed lover of cheap date ideas, these San Francisco flea markets cater to every sensibility. 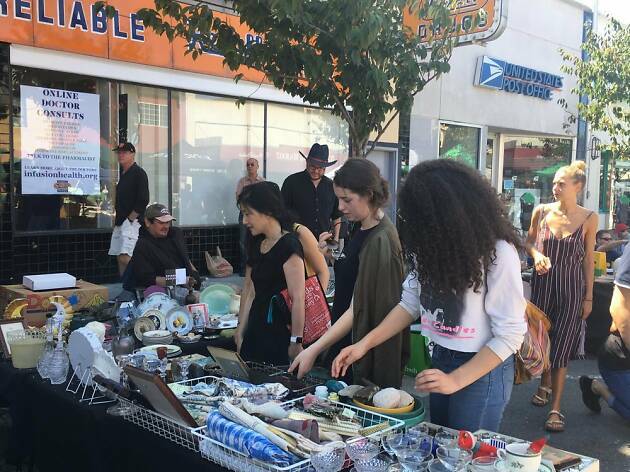 From the revered Alameda flea to the recently rebranded TreasureFest, you’ll find antiques, accessories, housewares, records, books and all manner of covetable and oddball junk for a steal. It’s all about the thrill of the hunt—and the sweet satisfaction of a bargain. 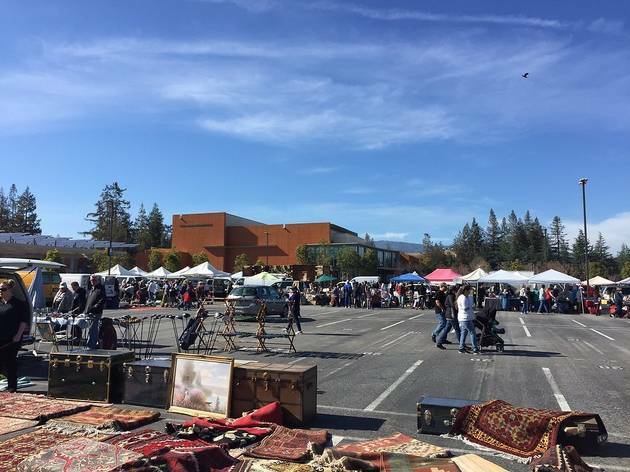 This monthly antiques fair—more commonly known as the Alameda Flea—is just a 20 minute drive from the city. As the largest antiques show in Northern California, it’s a rite of passage for Bay Area vintage-lovers. The orderly gathering features over 800 booths selling home decor, clothing, furniture, pottery, art, books, jewelry, and more. The fair (ahem, faire) takes its history seriously: All items sold are required to be at least 20 years old. 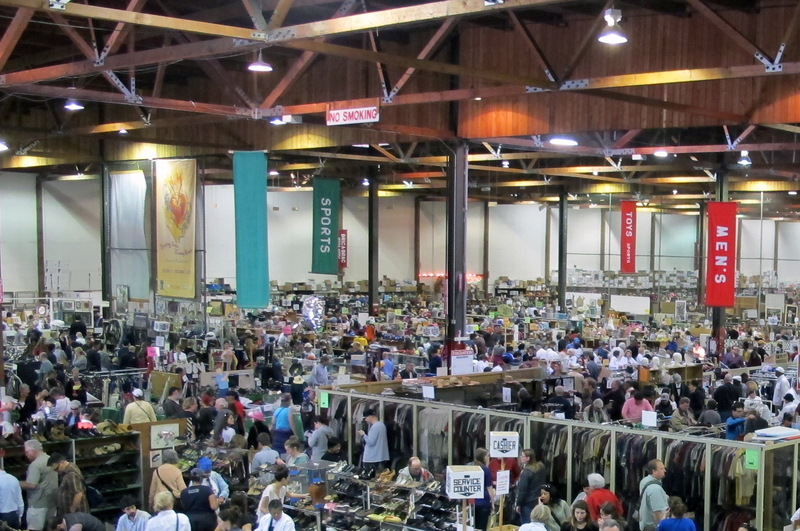 Accordingly, the crowd is made up of some serious antique hunters, many of whom start lining up well before 6am. 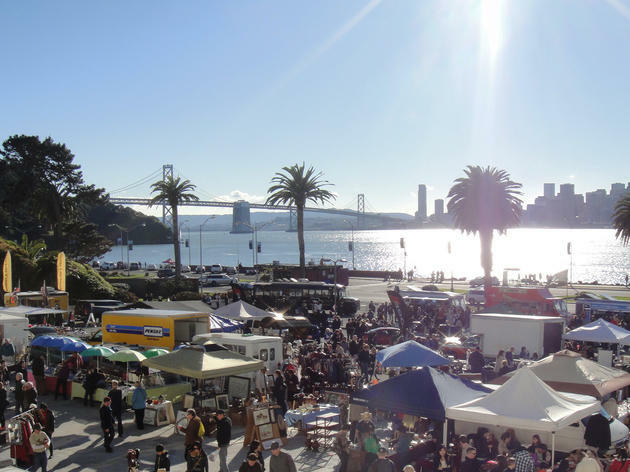 From the market grounds —formerly the runway for the Alameda Naval Air Station—browsers can take in views of the Bay Bridge, the San Francisco skyline, and Marin. 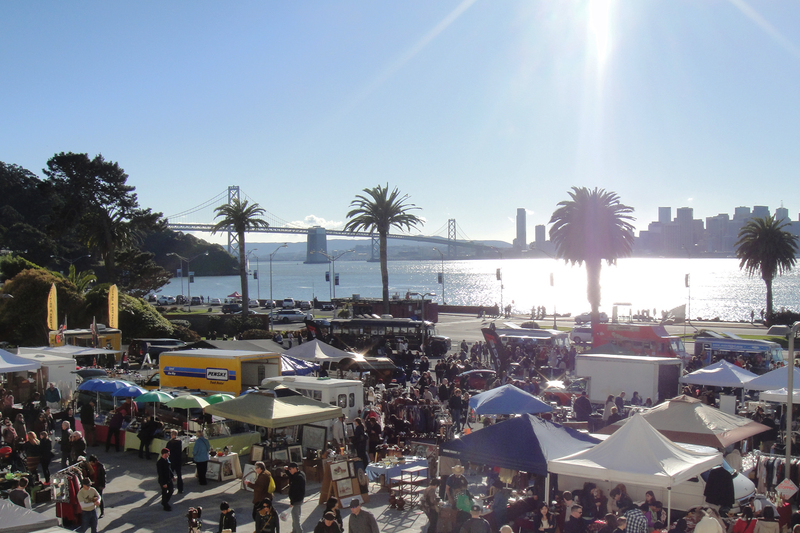 TreasureFest is known as the younger, hipper alternative to the Alameda Flea. Founded in 2011, the pet-friendly market fosters an lawn party atmosphere, complete with live music, cocktail bars, and DIY workshops. Hundreds of booths are packed with vintage clothes, jewelry, antiques, art, and crafts —some old, some new. Grab a drink, then check out the assortment of food trucks, which includes favorites like Chairman Bao and Bacon Bacon. TreasureFest’s annual holiday market is particularly popular, when snow cannons are trucked in to blanket the field with over 20 tons of snow. 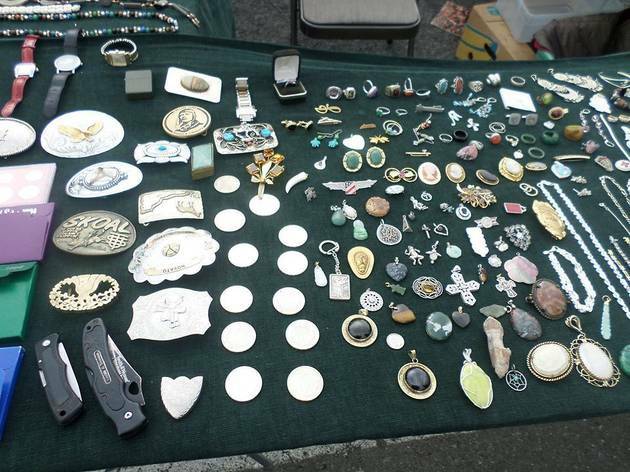 Alemany is a no-frills flea market for deal hunters not afraid to do some digging. Folding tables and a smattering of tents pop up under the shadow of the highway every Sunday. The makeshift booths are filled with a hodgepodge of vintage and secondhand merch, including toys, knickknacks, furniture, kitchen wares, records, books and more. The market requires that at least 50 percent of the wares must be vintage or antique—the other half is an eclectic mixed bag. The vendors here are generally open to haggling, especially if you arrive later in the day. Bring cash. This three-year-old newcomer takes over a busy stretch of Irving just south of Golden Gate Park once a month. The flea is entirely community organized and has a real neighborhood feel, from the kids’ games to the craft stations. Though the market itself is comparatively small—it usually features anywhere from 20 to 30 booths—you’ll find a colorful assortment of handmade cards and pins, housewares, dishware, antique jewelry, kids clothes, and more. There’s also an array of local food vendors. 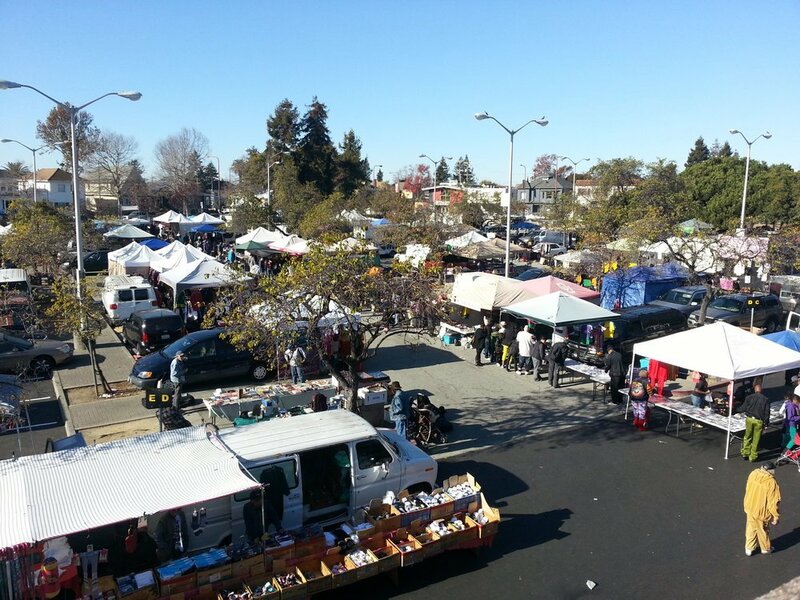 From the pounding drum circle to the homemade African food, the Berkeley Flea is a vibrant reflection of its community. 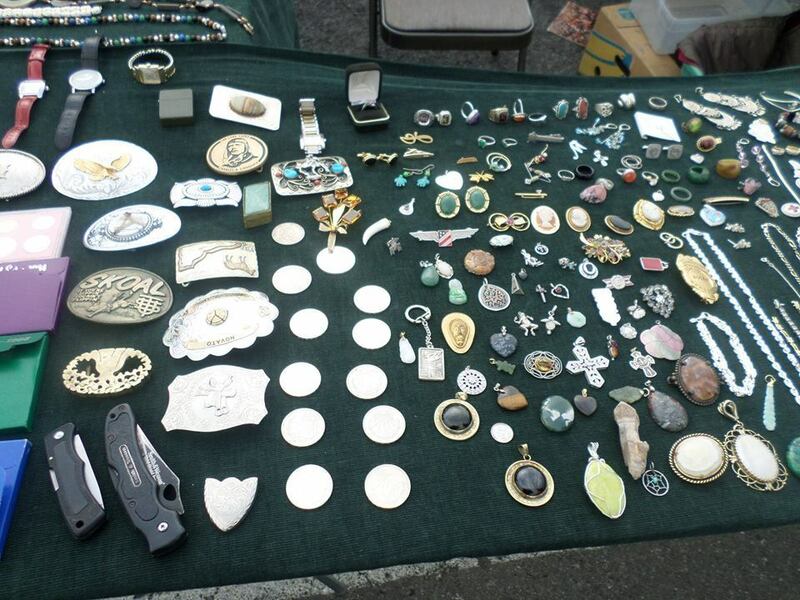 Vendors sell boho clothes, records, knickknacks, jewelry, and more. Some of the wares are new—handmade pine shelving, silk pillows, soaps and fragrances—while others are delightfully retro. 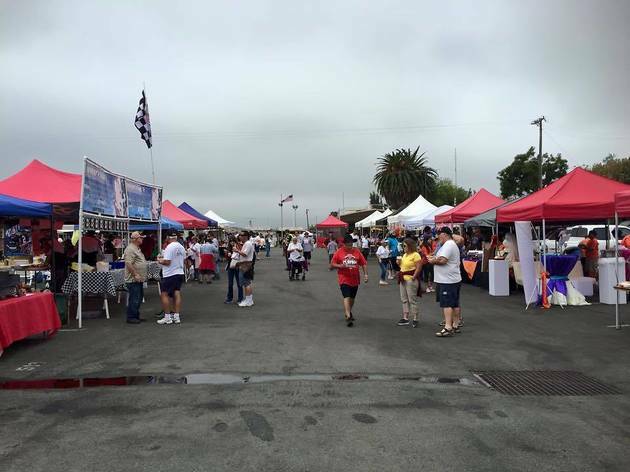 The lot hosts an open mic every first and third Sunday, while a “junior” market program welcomes younger vendors to sell their crafts every first Saturday. 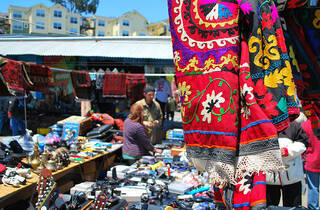 This market is particularly popular for its African wares, from the traditional mud cloth to the piping hot plantains. The De Anza Flea was was originally founded 30 years ago by a handful of local college kids aiming to raise funds for the student body. It has since grown to more than 800 vendors and draws as many as 20,000 shoppers each month. The market spills across two sprawling lots and is filled with vintage furniture, household goods, art, books, toys, antiques, clothes, and more. In recent years, the percentage of new merch has grown, as well, including jewelry, accessories, stationary, and plants. The Electronics Flea is a boon for gear geeks—particularly collectors of retro radios. 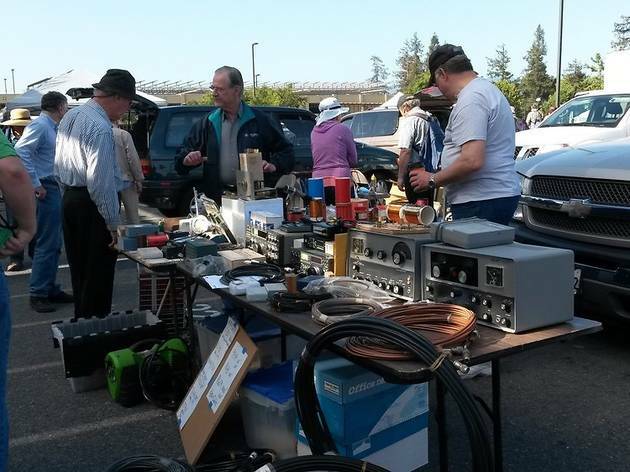 The market is organized by the non-profit Association of Silicon Valley Amateur Radio Organizations and benefits a different amateur radio org every month. 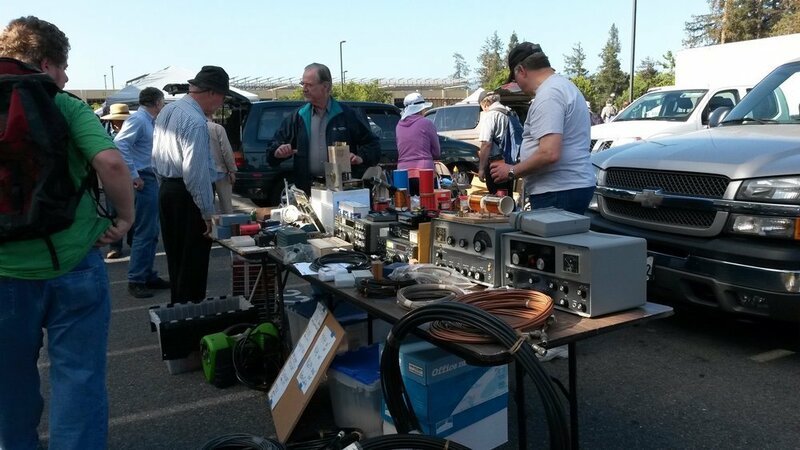 Fittingly, the monthly swap meet is a tangle of wires, screens, and antennae, from vintage radio equipment to used TVs. It’s also a convenient place to dispose of recyclable electronic waste, such as light bulbs and batteries. The market’s loyal band of regulars congregates around the concession stand, which sells hot coffee and fresh doughnuts for $1.75 a pop. The owners of the West Wind drive-in theater chain operate a mini-empire of flea markets and swap meets throughout California, from Santa Barbara to San Jose. 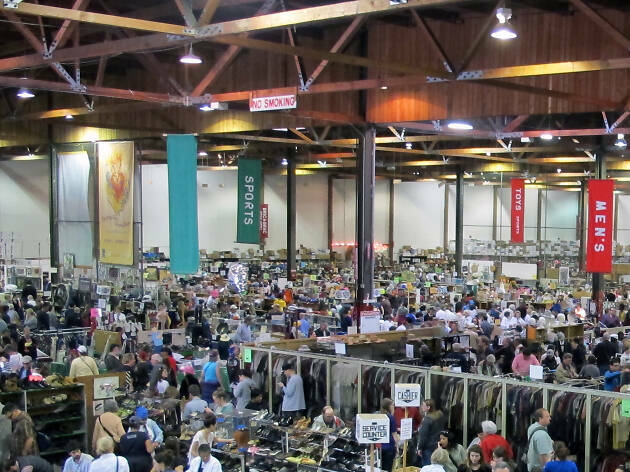 The best of the bunch is the Concord location, where you’ll find a mishmash of clothes, electronics, home goods, tools, second-hand toys, and antiques in more than 500 stands. (There’s also a small farmer’s market.) In addition to the mid-century merch, there are food stands for tacos and hot dogs, live bands, and beer stalls. Check the market website for Lucha Libre day, when colorful Mexican wrestlers perform in a makeshift wrestling ring. In 1960, George Bumb, Sr. bought 120 acres of an old meat-processing plant and turned it into a 20-vendor marketplace. 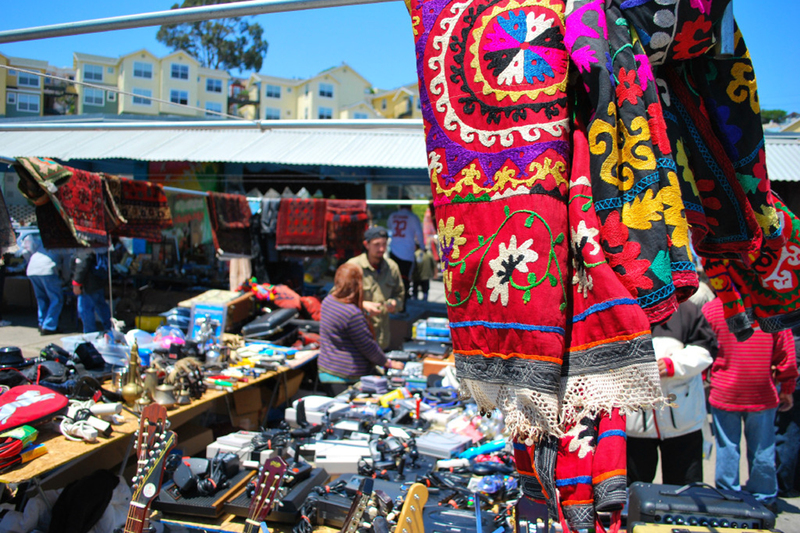 Today, the San Jose Flea claims to be the largest open-air market in the US, touting more than 1,000 vendors. 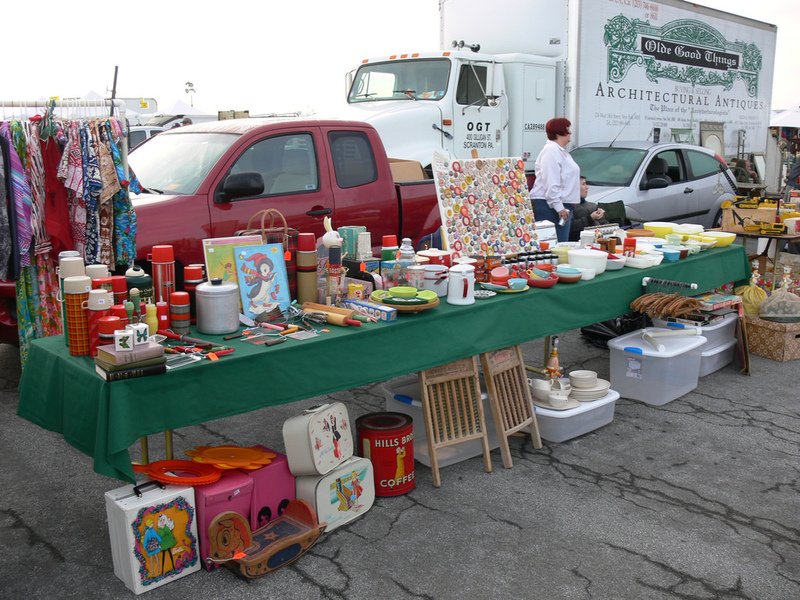 The wide-ranging assortment spans antiques to car accessories, books to herbs and produce. There are electronics dealers, fabric shops, and vintage clothing specialists. Concession stands serve fair snacks like popcorn, cotton candy, and nachos. In late 2019, with the expected completion of the Beryessa BART station, the Bumb family plans to add an adjacent farmer’s market selling fruit trees, plants, and produce. The Oakland White Elephant Sale happens just once a year—but it’s worth the wait. The organizers collect gently-used donations year round to amass a truly impressive haul, which fills a 96,000-square-foot Oakland warehouse; all the proceeds benefit the Oakland Museum of California. 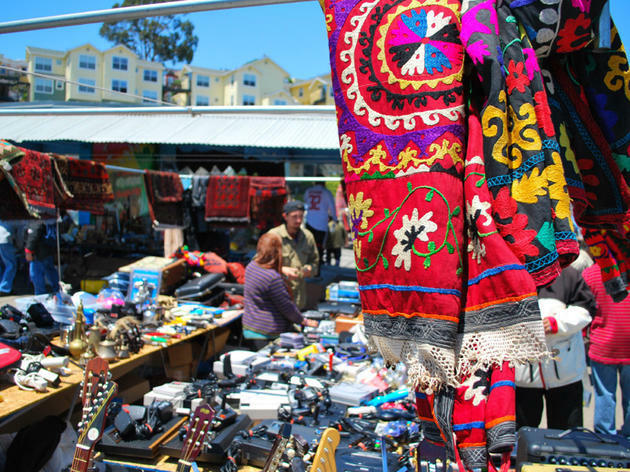 Compared with some of the Bay Area’s more down-and-dirty flea markets, the quality of the merchandise here is high: with the acception of vintage clothing, you won’t find anything dirty, damaged, torn, stained, or broken. All merchandise is grouped into 17 departments, from sporting goods to Asian collectibles, china to fine jewelry.